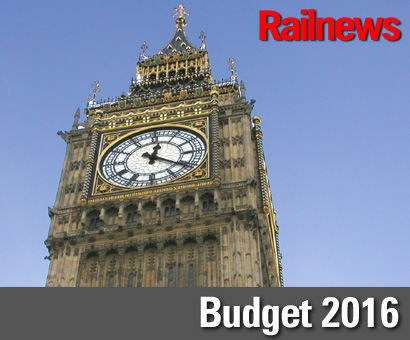 TOMORROW's budget will include funding for two major railway projects, the Treasury said today. The second rail development is formal recognition by the Government of the need for Crossrail 2, which will run across London on a north-east to south-west alignment, potentially connecting towns such as Cheshunt and Broxbourne with Woking and Guildford. Such a line would provide much-needed relief for London Waterloo station, which is the busiest in the country. Although detailed figures will only be announced tomorrow, it is known that an initial £300 million will be allocated to developing HS3, as well as a proposed road tunnel under the Pennines and other highway improvements, while Crossrail 2 will receive an initial grant of £80 million. Transport for London will be asked to find match-funding of the same amount, with the aim of introducing a Bill to authorise the project in this Parliament. The proposals are in line with a new report from the National Infrastructure Commission, whose chairman Lord Adonis said that Leeds and Manchester have the worst connections between them for two cities of comparable size anywhere in Europe. There are also plans to build 30,000 new homes on brownfield sites around the country, aided by a new fund worth £1.2 billion. Chancellor George Osborne said: “With the difficulties we see in the global economy, we’ve got to make Britain fit for the future. “We set up the National Infrastructure Commission to think for the long term, plan for the future and help us lead the world. The Campaign for Better Transport welcomed the Chancellor's commitments to new rail schemes, and to focusing housing development around railway stations, but said that these needed to be linked with local transport improvements. It also criticised the funding for the Trans-Pennine Road Tunnel. CBT chief executive Stephen Joseph said: "The commitment to invest in new rail projects is good news, especially for the North of England where rail networks have been starved of investment for decades. Putting housing development around rail stations is also a good plan. However, it's a shame the Chancellor is still supporting the damaging Trans-Pennine road tunnel proposal. This scheme would just increase pollution and road congestion in the cities and damage the Peak District - the money would be much better spent on improving local transport like supported bus services and road repairs to complement the welcome investments being put into rail infrastructure.